Welcome to Nautical Boat Club® at Lake Grapevine! We are the nation’s first and only Boating Country Club® – offering unlimited access to our fine fleet, as well as all Lake Grapevine has to offer. 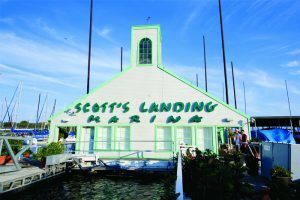 We’re conveniently located at Scott’s Landing Marina along the lake’s south side in Oak Grove Park. Scott’s Landing is Lake Grapevine’s largest marina, a mecca for boaters and other outdoorsy folks; Big Daddy’s Shipstore hosts delicious lakeside dining, while Oak Grove Park – one of the lake’s most beautiful recreation areas – features paved trails for hiking and biking, covered picnic tables, and sand volleyball. With 8,000 sprawling, sparkling acres of water and 60 gorgeous miles of shoreline, Lake Grapevine has so much to offer visitors – both on-land and on-lake. Our Boating Country Club® buys new boats each year and all of our watercraft are replaced every 2-3 years, so you always have the newest, neatest boats to take out on the water. And don’t forget our all-you-can-use free water toys – from skis to boards to tubes and more, we load you up with whatever “floats your boat” for fun!